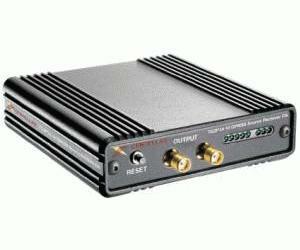 The TG2P1A is a wideband pseudo-random bit sequence (PRBS) generator with a fixed-rate internal clock, it is also capable of operating from 0.05-12.5Gb/s with a full-rate external clock. The TG2P1A makes an excellent PRBS source for 12.5Gbps (10Gbps plus FEC) SONET OC192 / SDH STM64 applications, datacom applications (including Fibre Channel, 10GbE - 10G Ethernet, XAUI, and OIF CEI). The pattern generator can be programmed to generate five PRBS pattern lengths and three mark/space densities. The 3.5 x 3.5 x 1" size allows close placement to the DUT and easy integration into your 10G or 12.5G test environment. Accessory ships standard with a North-American AC power cord; alternate country plugs are available. The TG2P1A supercedes the TG1P1A, and features 3.5mm SMA outputs (compatible with 2.92mm K-connectors).